Sorry... the 2017 Alfa Romeo Giulia is no longer being sold as new. 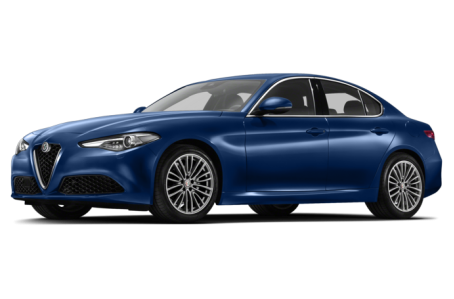 Instead, take the first step to a great deal on 2019 Alfa Romeo Giulia with a free price quote! The 2017 Alfa Romeo Giulia is an all-new midsize sports sedan by the Italian automaker. It competes with the BMW 3-Series, Mercedes-Benz C-Class, and Audi A5. Three trims are available: the base model, Ti, and Quadrifoglio. The Quadrifoglio is Alfa Romeo’s high-performance equivalent to the BMW M, Mercedes AMG, and Audi S lines of vehicles. In terms of style, the Giulia already makes a splash in its first outing. The Italian-influenced design exudes a sense of confidence, passion, and elegance. The front-end features the Alfa Romeo’s signature “Trilobo” shield grille with a sporty, wide-mouth lower fascia and aggressive Bi-Xenon headlights. A rear diffuser houses the rear fog lights and a dual-pipe exhaust system. Other standard features include power/heated side mirrors with turn-signal indicators and 17-inch aluminum wheels. Automatic high beams, active suspension, sportier styling, colored brake calipers, and unique 17- or 18-inch aluminum wheels are available as well. The Quadrifoglio comes with an aerodynamic, carbon fiber splitter system with narrow-slit air ducts at the lower front fascia, bonnet, and front fenders. The Giulia is powered by a standard 280-hp, turbocharged 2.0-liter 4-cylinder engine with automatic start-stop technology mated to an 8-speed automatic transmission. Rear-wheel drive comes standard, while all-wheel drive is optional. The Quadrifoglio is driven by a more powerful 505-hp, twin-turbocharged V-6 that produces 443 pounds-feet of torque paired with the 8-speed automatic and rear-wheel drive only. At the time of this writing, the fuel efficiency rating had not been made available by the EPA. Inside, the Giulia has a sporty leather-trim interior with a 40/20/40-split folding rear seat. The center stack features a standard multimedia system with a 6.5-inch display controlled by the center rotary dial controller as well as Bluetooth connectivity for phone and audio and a USB port. It can be upgraded with a larger 8.8-inch widescreen display, an integrated navigation system, and a Harman Kardon premium audio system. Standard features include dual-zone automatic climate control, a leather-wrapped steering wheel, remote keyless entry, push-button start, and cruise control. Full leather upholstery, wood trim, heated front seats, and a heated steering wheel are also optional. The Quadrifoglio has its own unique interior treatment with leather/Alcantara seating, genuine carbon fiber accents, and aluminum trim. Standard safety features include a backup camera and front and rear parking sensors. Standard double wishbone front suspension and a multi-link rear suspension with coil springs help keep the Giulia on the road. The available Driver Assistance Dynamic Package includes lane departure warning, forward collision warning, automatic braking, and adaptive cruise control. Other available features include a limited slip rear differential, a blindspot monitoring system, and rear cross-traffic alert. 21 of 22 (95%) consumers said they would recommend this vehicle to a friend.